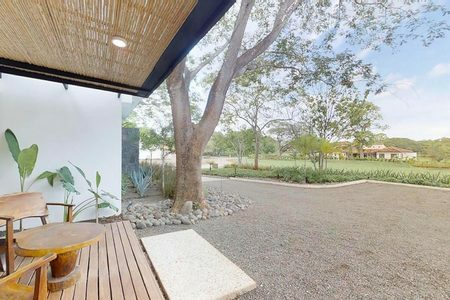 A clean modern and minimalistic design sets this luxury home apart from any other in the Hacienda Pinilla community. 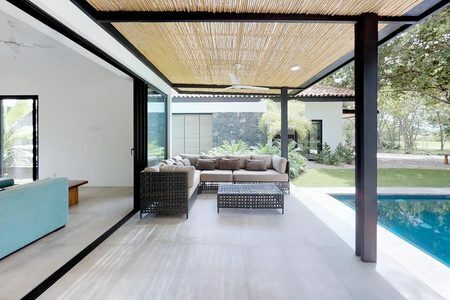 With a strong connection to the surrounding environment, this tropical home has been designed to enjoy tropical living as it should be. 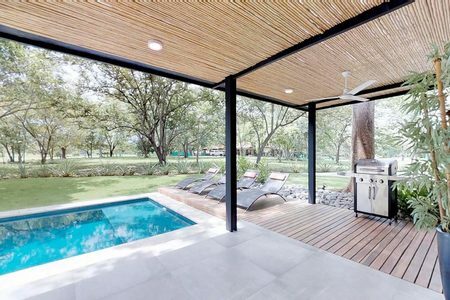 Situated amongst mature Guanacaste trees and opening onto a dedicated nature reserve, there is an ever-present connection with nature, a breathing timber skin, tropical outdoor bathroom's and cascading water features are just some of the design features throughout this Balinese inspired tropical home. 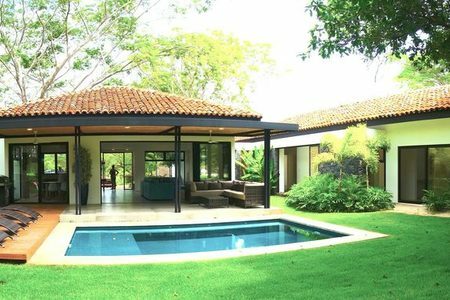 Residing in the exclusive beachside and resort community of Hacienda Pinilla, just 10 minutes south of Tamarindo, this luxury villa offers the complete package, luxury villa, a secure investment, tropical climate & world class amenities. Sprawling over 4000s.ft reside the 4 bedrooms and 3.5 bathrooms, pool, terrace, garage, and laundry. The 2 master bedrooms were both designed with private terraced decking with northern views over the adjacent green nature reserve. The remaining 2 bedrooms face west with glass sliding doors opening onto the expansive backyard. The home's orientation is divided into 3 wings. On the private eastern wing the master bedroom, private terrace decking, ensuite and walk in robe. 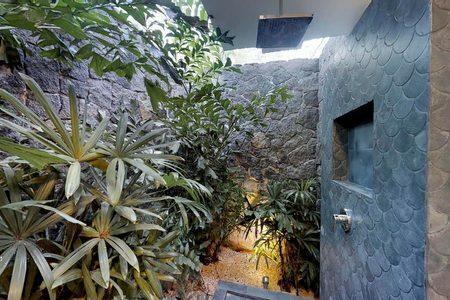 From here you access the western wings 3 bedrooms and 3 bathrooms through the 'nature trail' an interior timber decking and river stone path leads you around the cascading water feature and breathing timber skin to the west wing spaces, 3 bedrooms, and 2.5 bathrooms. There is a 2nd master bedroom on the far west wing with private terraced timber decking and northern views over the adjacent nature reserve as well as glass sliding doors opening up onto the pool area. The kitchen was designed with a modern and minimalist touch, an open plan with views and access to the front and rear terrace courtyards. 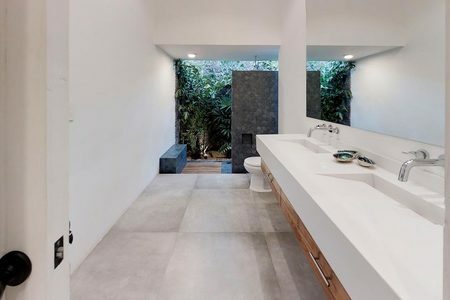 White quartz countertops line a clean and minimalistic space. The white quartz is beautifully offset with natural timber cabinetry and a beautiful organic bar top. The centerpiece island has been left clean creating a great space for entertaining guests. A professional gas powered cooktop, hood and oven make this kitchen the ideal working station. 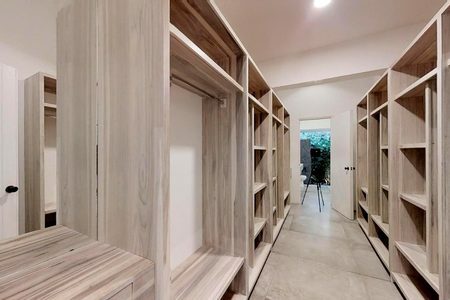 In creating this clean and minimalistic theme, a huge walk-in pantry has been divided into 2 spaces with the first holding the fridge, freezer, microwave and the 2nd space is a huge walk-in pantry with wrap around shelving. 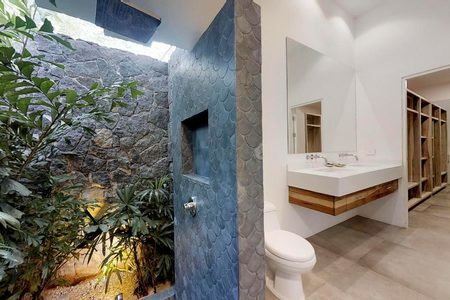 Casa Nativa was architecturally designed as a 4 bedroom home, however the 400s.ft garage space has been intentionally designed as a space that could easily adapt as an additional stand-alone villa. With the high rental demand in the area, this space could be a huge asset turning your home from a 4 bedroom home that sleeps 8 -10 into a 5 bedroom villa that sleeps 12-14. In creating this space the same porcelain 'polished concrete' flooring has been laid in the garage as is throughout the main home, a 30ft niche has been left with electrical and plumbing for a designated kitchen and large timber lined walls have been designed for cross flow ventilation, if this space was to be converted the timber slats could be replaced with glass sliding doors as are used throughout the home. With this garage conversion in mind, an extra 2 car parking bay was created in the private driveway, as well an extra large laundry area with additional owners storage shelved area. 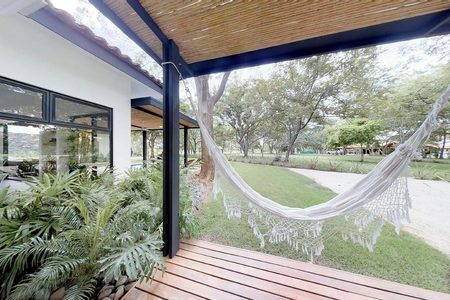 Just 10 minutes south of Tamarindo and only 1 hour from the international airport in Liberia, Hacienda Pinilla is the perfect location for your tropical home or incredible vacation rental.